Timeless and elegant, these Black Acrylic Desk Blocks are suitable for anyone. Let someone know just how much you appreciate them and their accomplishments with these unique name plates. 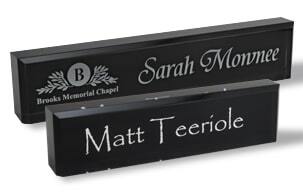 Each modern desk block is made from a crystalline acrylic and will be engraved with your choice of text and logo that will suit the receiver flawlessly. Front engraving gives these blocks a solid look while engraving the back brings out the text and logo by providing reflections and depth. Pricing includes a Black Desk Block with one or two lines of engraving and an optional logo ($10 set-up fee on first order). Desk blocks with front engraving may be filled with silver, gold or white.